Feebas has always been an odd Pokémon. It has always been rather rare to find and is always seen as a mirror of Magikarp. In the original Pokémon Ruby & Sapphire games, Feebas was incredibly hard to find. To get it, you had to fish in one of up to 6 special tiles in Route 119's waters. These tiles were calculated based upon your ID number as well as the trendy saying you set at Dewford Town. This time, however, things are different. Now, Feebas has a 5% chance of appearing with any rod in Route 119. This makes Feebas a lot easier to find, but still has a rare aspect to it, but there's something more. There's an easier way to find Feebas. 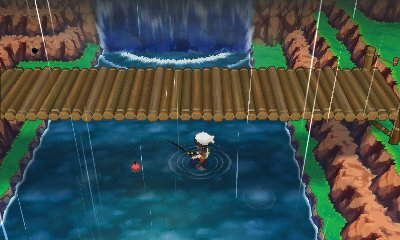 During the daytime, if you go to this bridge under Route 119 and fish underneath it, you will have a 100% chance of finding Feebas. 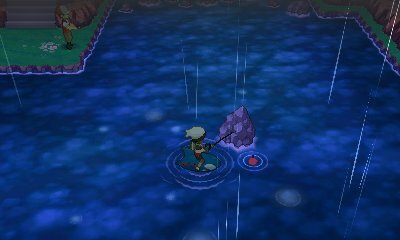 Alternatively, at night time if you fish around this rock in the south of the route, you will also get a 100% chance of finding it. This allows for you to easily chain fish it, or just generally capture it. From there, you can also find it in the waters by searching for it with the DexNav. 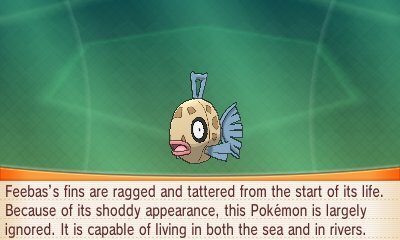 Feebas also has a rather unique method to evolve into its final evolution, in fact it has two of them. 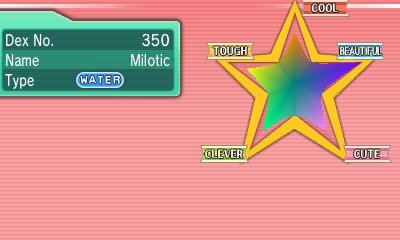 First, if you attach a Prism Scale, which in Generation VI is only available in X & Y, to Feebas and trade it, it will evolve into Milotic. However, thanks to the reintroduction of Pokémon Contests, the original method to evolve Feebas into Milotic has become accessible once more. This method has you have to use PokéBlocks to boost Feebas' Contest stats. Once you have got its Beauty to near maximum levels, when you level it up it shall evolve. It's as simple as that. To do this, you'll need to use Blue or Rainbow PokéBlocks.